Recognised by major airlines this Flight Attendant/Cabin Crew course will open the door to an exciting career in aviation. Stand out from the crowd and set your sights on flying high in a Cabin Crew career. This online Flight Attendant / Cabin Crew course has been developed by ex-cabin crew who have years of experience flying for leading airlines. As one of the only online cabin crew courses that is recognised by major airlines you can be sure that you’ll learn the key skills and knowledge to WOW any airline employer at interview. 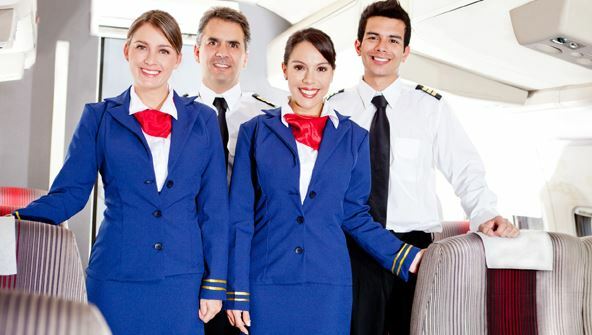 The lessons in ths Flight Attendant / Cabin Crew course contain all of the information that you will typically be expected to learn on joining an airline as Cabin Crew, giving you a huge advantage over other applicants at interview and initial training. Many students who have completed our course say that the confidence gained through completing it was invaluable when in their airline interview. In addition to your course you will also be given access to our invaluable online CV builder and job application system. Specific to the cabin crew industry, no other flight attendant course offers anything like this. You will be guided through the process of building your cabin crew specific CV and then submitting it directly to our partner recruiters from major airlines, giving you a genuine advantages over other applicants. Unlike many other courses which only offer downloadable certificates, upon successful completion of our course you will receive a hardcopy certificate mailed to your home address. Perfect to take along to your airline interview! From the moment that you enrol in Flight Attendant / Cabin Crew you will become an integral part of our learning community. You will experience the perks of classroom studies such as chatting by the water cooler or sharing your opinion on a specific task, all in your own home.